There is broad agreement that as much as and so on. It will be an incredible resource to requires community involvement to succeed. To a large degree, however, the industry as tive collaboratively founded by the World information quickly and broadly. 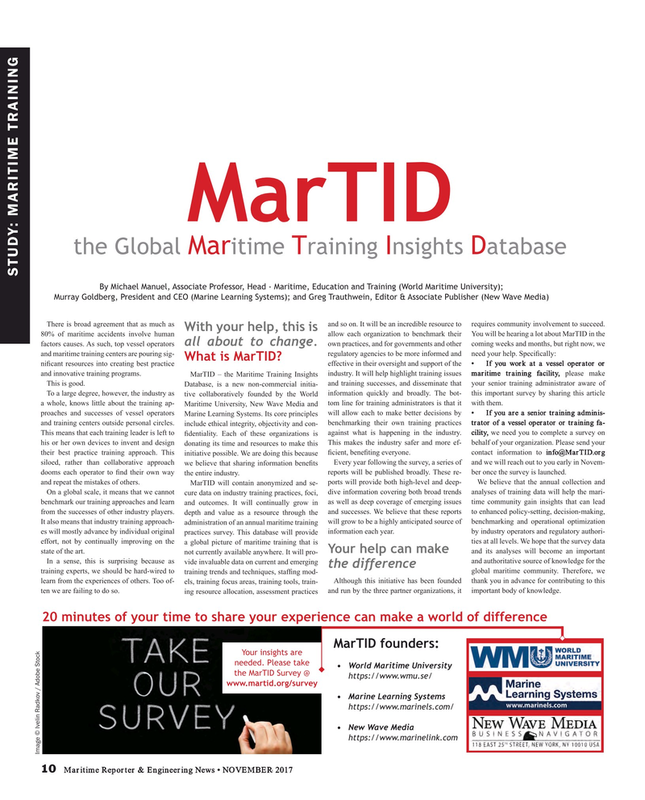 The bot- this important survey by sharing this article a whole, knows little about the training ap- Maritime University, New Wave Media and tom line for training administrators is that it with them. Every year following the survey, a series of and we will reach out to you early in Novem- siloed, rather than collaborative approach we believe that sharing information bene? ts reports will be published broadly. These re- ber once the survey is launched. dooms each operator to ? nd their own way the entire industry. In a sense, this is surprising because as vide invaluable data on current and emerging the difference training experts, we should be hard-wired to global maritime community. Therefore, we training trends and techniques, staf? ng mod- learn from the experiences of others. Too of- Although this initiative has been founded thank you in advance for contributing to this els, training focus areas, training tools, train- ten we are failing to do so. and run by the three partner organizations, it important body of knowledge.